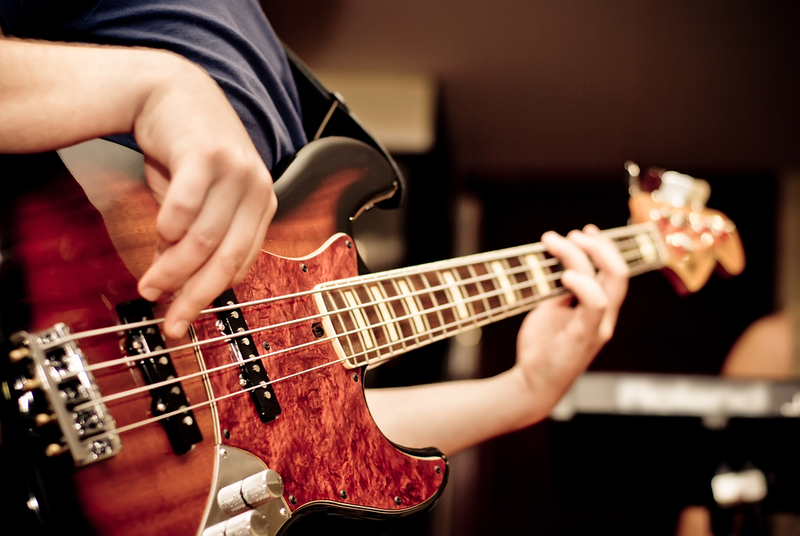 Bass guitar tuition is available from beginners to advanced level teaching all styles including rock, pop, jazz and many more. We offer exams through Rockschool, however this is not compulsory we also teach for leisure play. Your lesson is a regular weekly slot in our timetable. This is kept to the same day and time wherever possible unless notified otherwise. Group lesson duration is one hour, whilst individual lessons run for 30 minutes. To ensure our timetable runs smoothly it is essential that your allocated times are strictly adhered to. When a new student enrols with us at M2K, they will be expected to complete a course of 46 lessons per annum. As a year consists of 52 weeks, 6 of these are not chargeable and allocated to you as holiday. Guitar 30 mins. group lessons £46.50(per month), Singing, Drums & Violin 1-2-1 30 mins. £61.33(per month). payable at the start of each month/lesson. the following: illness/ holiday and bank holidays etc..
To compensate for any Missed Lessons(due to illness, holidays etc.) a Catch–Up will be provided(this must be taken with-in 14 days following the cancelled lesson). These can be taken at any time within the 2 weeks when mutually convenient to maintain your 46 week programme. Under No circumstances will missed lessons or outstanding catch-up's be used as a reason for non-payment of fees. If you miss or cancel your lesson with out giving 24 hours notice, you will be charged in full. Ideally you will need an instrument at home to practice on. This however does not need to be an expensive one, especially if you are a total beginner. We will be happy to advise you accordingly. We use the following examination boards; London College of Music, Associated Board of the Royal Schools of Music, Trinity College and Rock School who are all fully recognised with their qualifications being accredited by Ofqual(higher grades earn UCAS tariff points for entry to University). Exams are available but not compulsory, we simply offer every student the choice or if preferred, play for pleasure. To terminate lessons with M2K we require one month’s paid notice. Missed lessons/outstanding catch-up lessons cannot be included for non-payment of the notice period. All complaints must be directed to Mr Steve Flaherty at MUSIC 2OOO(sales showroom), located at 11 Broad Lane, Bradmore, Wolverhampton, WV3 9BN, either in person, email sales@music2000.co.uk or phone 01902 345 999. Threatening / abusive behaviour towards staff / customers(i.e. Students, parents etc.) will not be tolerated. You will be asked to leave the premises and you / your child may be removed from the lessons permanently as a result. These terms and conditions constitute the entire agreement between both parties(yourselves and M2K). Please sign and return to M2K Music School at your earliest convenience(retaining your customer copy).